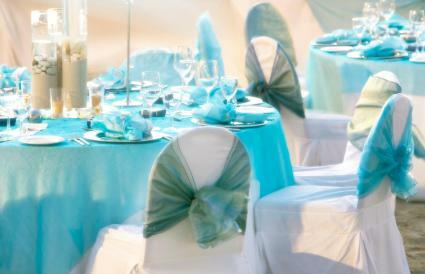 Couples choose tulle wedding decorations because tulle adds an understated elegance to décor without adding a big bill. It goes from inside to out and from the ceremony to the reception, providing a cohesive look to the entire event. Ceremonies held in religious buildings may not need excessive decoration. Other indoor locations, like banquet halls, may need decorations brought in, and outdoor locations might need to hide a few weather-related flaws. Tulle is an affordable choice for all of these applications. Cover the altar area or table at the front of the ceremony with tulle. 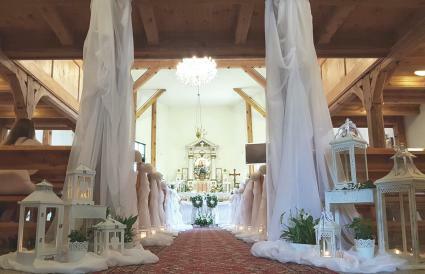 Tulle can also be used to cover altar flower arrangement and weaved through candelabras at the front of the church. 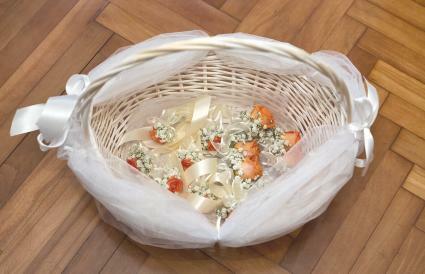 Tulle wedding bows can also be added to the ends of each pew or chair, with or without flowers or candles. 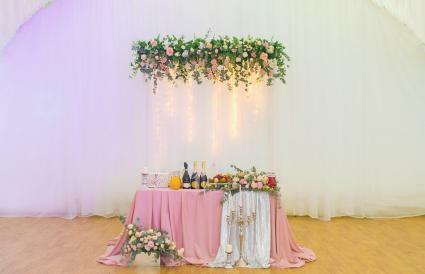 While the altar area or front of the ceremony and seating are common places to add tulle, you can incorporate them in other areas of the ceremony. Hang small white wedding lights in gathered tulle swags above doors and windows. Balcony railings, both inside and out, can have tulle wound around posts. 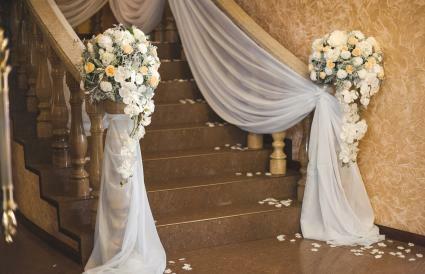 Decorating banisters with tulle is easily done and allows the bride to make a grand entrance. Hang tulle from the ceiling at entrances to indoor ceremonies. 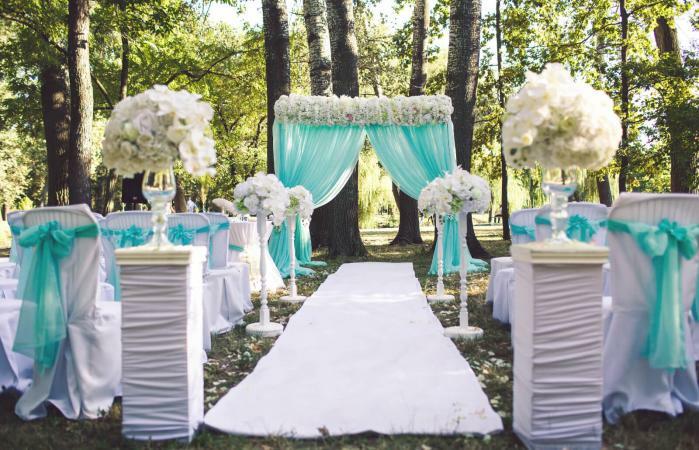 At outdoor ceremonies, it's common to have canopies or bridal arches; use tulle to decorate the posts, adding flowers, poms, and greenery to enhance the design. Outdoor wedding ceremonies might benefit from tulle use as well. Tie bows around chair backs to dress up plain rentals. Colored tulle on white or black chairs can be striking. Walking paths can be marked off by using tulle as a delicate fence. Wrap tulle around posts and columns to help camouflage flaws for gazebo decorations. 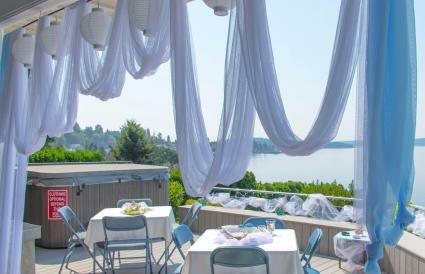 Outdoor structures without a ceiling can utilize swagged tulle as part of the decorations. Wedding receptions held in large halls, banquet centers or convention centers often require a lot of decorations. Tulle is a practical way to transform the site into your dream wedding reception without adding massive materials or labor costs. Match the ceremony décor to the reception décor. If you had swags at your ceremony, use swags across the front of your cake table and head table. Wrap tulle around doorways and banisters using the same techniques as you did at the ceremony. This creates a unified look for all your wedding festivities. Not every wedding reception location has beautiful walls to surround your festivities. If this is the case, you'll want to add tulle to walls and create tulle wedding backdrops behind the head table. Mix tulle with satin and other fabrics for a fresh look. White, gray, black, tan, and navy make excellent neutral backgrounds that showcase colorful linens, flowers, and other decorations. Creating dramatic swags with tulle can help separate spaces at an indoor or outdoor reception. Use white for a light and airy look, or darker colors for a dramatic effect that separates areas even further. Include lights with the tulle for ambiance; accomplish this using strands, hanging fixtures, or paper lanterns. 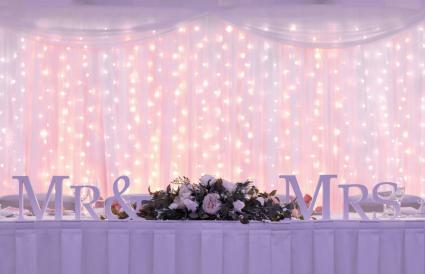 Soften your lighting options by adding lights to your tulle decorations. Hand strands of light behind a couple layers of tulle. Incorporate this into backdrops, head table covers, and cake display tables. Additionally, lights can be added to ceiling swags and around arch and gazebo columns. In fact, you could even light a wedding wagon with tulle and LED candles. Add tulle to your table decor. Tulle makes a quick and easy runner or overlay on table linens. 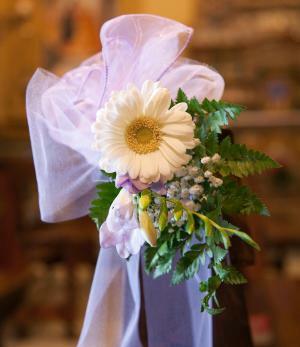 Use the same color to wrap around chair backs and tie in a knot or bow. If desired, you could nestle battery-operated candle or floral centerpieces in a cloud of tulle. Tulle is one of the most versatile fabrics used in decorating for weddings. Whether it is small accents here and there, such as bows, or large ceiling canopies, you can choose to put as much or as little tulle into your décor as you wish for the effect you want to achieve. Tulle is an affordable wedding decoration that will continue to be a popular decoration piece for years to come.